Since getting the new refrigerator, revamping the larder cupboard, getting the vacuum sealer and experimenting with canning, bottling and picking – we’ve been stocking up even more intensely. Well – now that we have the space, or the re-vamped space, and the technology – why not? Indeed, thanks to a fortunately-timed stop at the marked-down shelf at the local HEB a couple of weeks ago, I can report that our requirements for exotic vinegars, balsamic and otherwise, have been fulfilled for the foreseeable future. And one of our projects over last weekend was to clear out the deep-freezer in the garage. Yes, indeed – it is possible to lose track of what is on the rearmost shelves; we found a package of frozen chicken with a best if by date of 2008 on it, as well as some other stuff that was so old we didn’t even recognize it at all. Hence – our current insistence on labeling and dating items before consigning them to frozen storage. 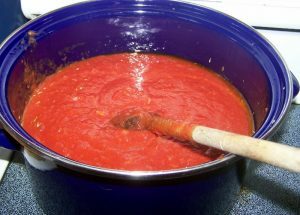 This weekend I had a new project – that of making an enormous batch of marinara sauce. The Pioneer Woman, Ree Drummond, has a very simple and serviceable one on her website, but I went for broke and doubled it, with an eye towards adding different things when the basic sauce is eventually used. We do have a liking for meatballs in marinara over spaghetti, a dipping sauce with calzones, as a basis for eggplant parmagiana, and sometimes in desperation, for pizza. If I make it, we will use it, one way or another. 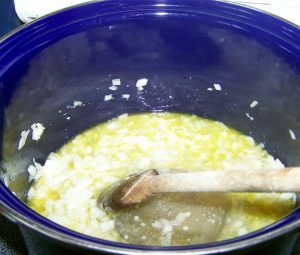 Slosh a couple of tablespoons of olive oil in the bottom of a fairly large pot, and gently sauté six or seven cloves of slivered garlic and two medium—sized chopped onions. 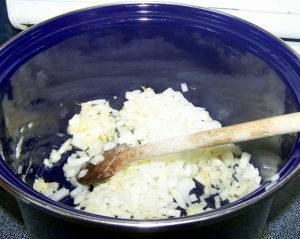 When the onions are limp and the garlic aromatic, deglaze the pan with one cup of chicken or beef broth, and simmer until the liquid reduces by half. Pour in a whole number-10 sized can of crushed tomatoes. 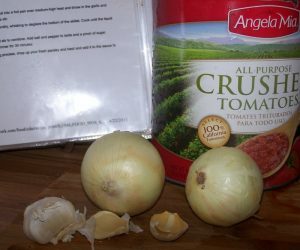 A number-10 sized can will contain about three quarts of tomatoes; this is why I used the big pot to cook this up in. Stir in salt and pepper to taste, 1 teaspoon of dried thyme and a pinch of sugar. I left this to simmer over low heat for nearly an hour. Toward the end of that time I added half a bunch or ½ cup chopped fresh parsley and about a quarter of a cup of chopped fresh basil. I had a number of pasta sauce jars given to me by a neighbor who thought they were the sort which could be re-used in home canning – they can’t, of course, but they were a good size, and the batch of sauce filled up four of them. 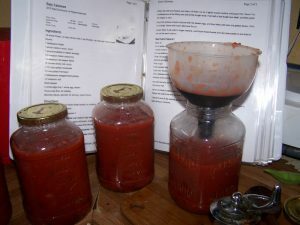 I put the lids on very loosely, so that the sauce would have space to expand as it froze and not break the jars. They do sell special containers for freezer condiments, or I could have parceled it out in vacuum-seal bags, but the recycled pasta sauce jars are what I had on hand, and they didn’t need labels.